Black titanium appeared as a necessity to provide a solution for a need that largely evolved in the titanium jewelry sector. 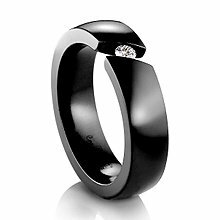 Black is a classy color and matching it with the durability and strength oft the titanium was a natural choice, fueled by many that wished to get a black titanium ring for the meeting with the priest. In the beginning a black coating, called PVD - Physical Vapor Deposition - was applied to titanium products. The result was a thin black layer that kept none of titanium unique qualities, as it usually was not titanium. This solution is still widely used, especially in those new shiny titanium black computer cases or mobile phones and other electronics hardware. Well, at least in those that contains some amount of titanium at all, because there are a lot of consumer products that are marketed under titanium’s large cloak, but have never seen an atom of the metal during their entire production cycle and are more likely get in touch with titanium after they have been bought. Logically, the real solution came from the very only people that first created the problem – the jewelers. While working for a special order, Edward Rosenberg, the designer and CEO of Edward Mirell, one of the leading titanium jewelry designers in the world, heated a number of refractory metals, probably including titanium, with 18k white gold – at least this is what he publicly stated. At some point during this process, the newly created alloy turned jet-black. While studying the item more attentively, he discovered that the black layer was not just a surface thin film, but rather a rather new compound embedded in the microstructure of titanium, creating an entire new alloy. The tests soon revealed that this new black titanium alloy did retain the whole array of titanium properties. Given the favorable feedback he got from his clients, he swiftly patented the production method, and now real black titanium is a proprietary alloy of Spectore Corporation, under the registered designation BLACK – TI. Given its background, and its relatively high price, titanium black alloy has only been used so far in jewelry industry. Here are some of the best examples, from Edward Mirell collection. As it turns out, one incident is enough to spawn a whole new different material. Spectore has not made publicly available all the details of the titanium research that is currently developing, but we can grasp a glimpse of the future by reading Rosenberg’s statement, which I strongly approve, “the technology in this sector is as far removed from what one sees in jewelry as the old tube radio is from today's High definition movies”.